Today the Caravan group went to Baticoloa, a tsunami affected area. It is in the Eastern Part of the country. The Caravan mainly focuses to bring sovereignty to the tsunami victims so that today’s programs in the tsunami affected areas brought many opportunities to highlight the key issues pertaining to the tsunami affected community. 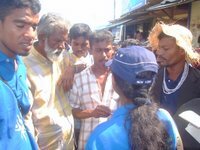 The street Drama group conducted their sessions at a tsunami affected camp, namely as “Action Firm” in which nearly 1200 people live in the temporarily shelters. 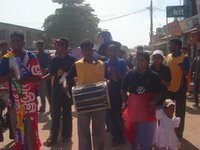 It was a good environment for the drama group to educate the victims on various issues. The drama sessions went on fruitfully. The main seminar held at Kalladi, “Bridge View” hotel. 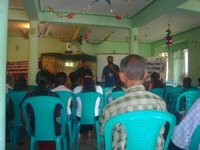 There were about 70 people for the seminar and the people were educated on WTO, PPC, Fisheries Policy & Sustainable Fisheries Policy. The speakers were Mr. Hreman, Miss. Iresha & Mr. Jesudasan. There were many questions raised by the people and the satisfactory answers were given by educating them at a great length.